There are many times we want to take notes while on a call and search for a pen and paper in a hurry, but if you are using an Android Smartphone there is an App for taking notes during a call which can be quite useful. We could see this option in Blackberry smartphones mostly because they were business oriented and that is one of the points which I liked about Blackberry devices. The feature to take down notes during a Call can really be useful, earlier there were many tutorials which showed how to use browser as a notepad to note down information while on a call. But now all you have to do is download this app and you can take down notes during a phone call to view it later. The app which we are talking about is NOTEify which is available for Free in Google Play Store, let me explain how to activate and use the app. Note: You have to sync contacts and the contacts which are synced will get the option to use Note. Here is the link to the App from Google Play Store: NOTEify tap on it and you can install the application from your Laptop/PC or directly on your android device. After installation is complete tap and launch the app and you will get a notification which asks you to sync Contacts with the App. Sync you contacts and you will be directed to the app. Here you have to tap on Menu and then Settings and you will have to select “Activate Notes” and then “Auto Save Notes” which will activate and auto save notes as you enter them. After you have completed setting up the app here is how you can use the Notepad. 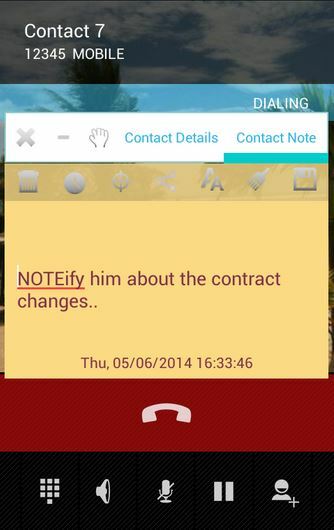 During a Phone Call you will be getting a Pop up window which shows Contact Details tab and Contact Notes which will help you see any earlier notes which are saved to that contact. And from here you can Enter the Notes you want to save. After Entering the Notes you have to select where to save the notes after the call has ended. There is also an option to share the notes after saving them directly from the app. This is a great app which helped me get what I wanted that is to get a notepad while on a call. This app can be used in Samsung, HTC, Motorola, LG, Xiaomi, Micromax and any other devices which run on Android OS. Do let us know if know of any other better apps which can be used to take down notes during a call.